This past year has been an intense year of divisiveness in American politics. Debates about climate change, economic prosperity, health, and social justice are on the verge of becoming explosive. Meanwhile, 2016 was the hottest year on record, with unprecedented fires, droughts and floods endangering our most vulnerable communities and costing billions of dollars. In fact, flooding from two storms that hit the coastal plain of the U.S. South (Floods in Louisiana; Hurricane Matthew) turned out to be two of the most costly natural disasters in the world last year, with combined costs estimated at $15 billion. Rural communities along our rivers were the hardest hit. Within this broader context of a nation facing huge challenges, the launch today of the Wetland Forest Initiative is a reason to have hope for the future. This bold and ambitious conservation initiative, focused on increasing protection for wetland forests, which span 35 million acres across 14 Southern states, represents a unified effort to secure a safer, healthier and more economically just and prosperous future for the rural South. The Wetland Forest Initiative is as much about protecting people as it is about protecting wildlife and birds. It’s as much about saving taxpayer money as it is about saving species. It’s as much about safeguarding our communities from natural disasters as it is about improving the economic conditions for rural southerners and creating more options for landowners. It’s as much about maintaining the diversity within the forest as it is about embracing the wisdom in the diversity of people that define the Southern culture. It’s as much about public benefits as it is about private ownership. And, it’s as much about the here and now as it is about the legacy that we leave for future generations. From Native American tribes like the Poarch Band of the Creek Indians to climate justice groups like the Hip Hop Caucus to landowner organizations like the Black Family Land Trust and the National Woodland Owners Association to state and federal agencies to national, regional and local conservation organizations, this new effort aims to strengthen our nation’s economy and rural Southern communities through scaling up the conservation of wetland forests. Keeping wetland forests standing strong is one of the smartest investments we can make over the coming decades to keep our coastal communities safe from natural disasters. In addition to providing natural flood control, they also ensure a stable, clean drinking water supply for millions of citizens. Historically considered worthless “swamps”, much of these forests were drained, converted to agriculture, developed or replaced with fast-growing commercially desirable pine trees for lumber and paper. Over time, this resulted in the loss of nearly 80% of our Southern wetland forests. Growing awareness about the importance of wetlands and the extent of their loss triggered the adoption of various regulations which have helped stem their loss over the past 15 years or so. But only a small fraction of the remaining wetland forests are afforded permanent protection and logging continues unabated and unregulated. Most of the forest is owned by private landowners, many of whom log them to pay taxes, send their children to college, retire or take care of an elderly parent. Leaving wetland forests standing just doesn’t pay the bills. Often twisted and sometimes hollowed-out trunks of hardwood trees growing in wetland forests are often referred to as “low-value, wastewood” by the forest industry. Frequently they are clearcut and the wood is sold by landowners for less than $10/ton for mulch, paper and, more recently, for fuel to generate electricity at power stations in Europe. Logging rates in the Coastal Plain, where most of these forests can be found, are among the highest on Earth. Despite having the strongest markets for wood in the world, many of the rural communities connected to these forests are struggling to sustain their local economies. But across the South and nation, there is a growing understanding of the high economic value associated with the unique ecological services our wetland forests provide. In light of increasing economic costs associated with natural disasters, the value of standing wetlands as a safeguard against flooding and droughts has never been more evident. In fact, research from the University of Georgia found that the value of wetland forests for things like flood control, storm protection, water purification and carbon storage exceeds the value derived from logging. The Wetland Forest Initiative aims to help landowners and communities realize the economic value of these critical services. Beyond their economic value, the wetland forests of the South are among the most unique and amazing forests in the world. Designated in 2016 as a global biodiversity hotspot by the Critical Ecosystem Partnership Fund, these forests are some of the most diverse on Earth, providing critical habitat for rare wildlife such as the Louisiana Black bear and the Swallow-tailed Kite. Over the past year, Dogwood Alliance has been reaching out to organizations, communities and government agencies in an effort to unify regional efforts and elevate wetland forest protection as a national priority. It’s inspiring to see the partners that have come together behind a shared vision of expanded protection for this national treasure. Years from now, our children and grandchildren will appreciate the way we came together, setting aside differences to change the way we think about and value these forests to create a better future for them. 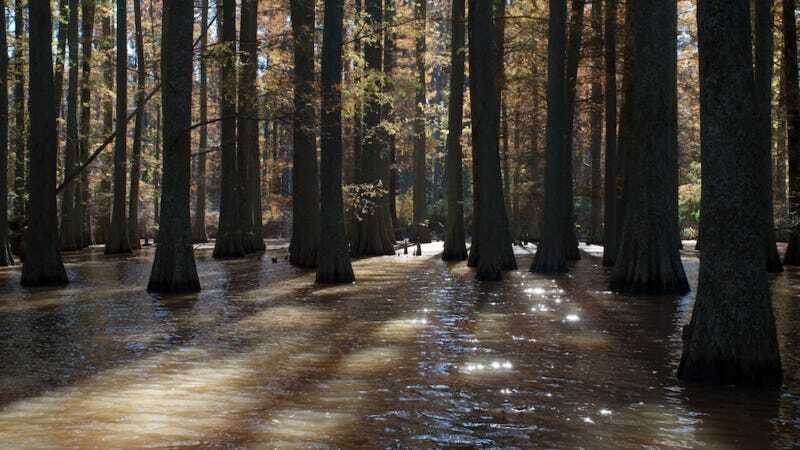 They will treasure a new generation of old growth wetland forests that have been permanently protected, much in the same way we treasure places like the Congaree National Park and the Big Cypress National Preserve today. They will witness millions of acres more returning to old growth status. They will enjoy the health benefits of kayaking and bird watching and just being among the trees, animals and plants that are thriving instead of struggling to survive. They will value the natural flood control and the cooling effects of large expanses of intact tree cover. Future landowners will take pride in the fact that they generate revenue by helping keep their neighbors safe from storms and helping to provide them with abundant fresh water to drink. The whole community will be proud of the wood products produced from conservation-based management of these forests. And our diverse, rural communities will reap the economic benefits of a more diversified forest economy that truly values nature and the services it provides. Yes, today is a reason to be hopeful.